NTT Communications introduced a suite of NFV-enabled services that can be instantly activated online and are powered by Virtela's global SDN platform. Virtela Technology Services was acquired by NTT Com in January 2014. 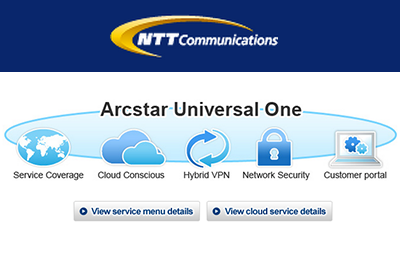 The new services are offered via a pay-per-use model under NTT Com’s Arcstar Universal One portfolio, which are delivered to enterprise customers in more than 190 countries/regions worldwide. The new services will become officially available for sales starting from July 2014. Cloud-Based SSL VPN: Enables remote workers or partners using any device to access the enterprise network. "While many industry experts and service providers have long been speaking about the potential of NFV, we are excited to become the first service providers to commercialize NFV-enabled services on a global scale," says Takashi Ooi, NTT Com’s Vice President of Enterprise Network Service. "NFV is a technology to virtualize network functions that traditionally run on physical appliances. Leveraging NFV technology in our Local Cloud Networking Centers worldwide, we can now deliver varieties of network functions - such as firewall and application acceleration for branch offices - from our network cloud. This eliminates the ‘one device, per service, per location’ model, resulting in significant cost savings for our customers." All Nippon Airways was cited as an early customer. "The ANA Group is deploying NTT Communications services, such as Arcstar Universal One IP-VPN service and a newly introduced cloud-based unified communication solution. The unified communication solution, which is supported by a highly reliable network, is further helping us to improve operational efficiency and save four million USD annually. By making use of cutting-edge technologies and services, such as NFV, we expect to continue benefitting from reliable, flexible and cost-effective ICT infrastructure from NTT Communications," stated Takanori Yukishige, Senior Vice President and Chairman of the Business Process Innovation Committee. 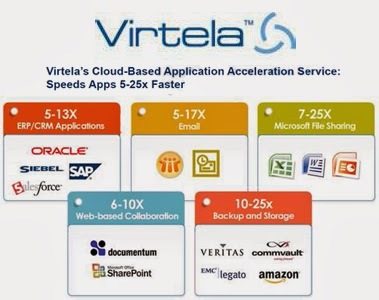 In January 2014, NTT Communications completed its previously announced acquisition of Virtela Technology Services Incorporated (Virtela), a leading global managed and cloud-based network services company. The deal was valued at $525 million when it was first announced. "Leveraging advanced virtualization technologies, such as Network Functions Virtualization (NFV), features such as firewall, WAN acceleration and SSL remote access will be delivered from network cloud. Furthermore, these features are automated for on-demand activation and configuration, helping enterprises save capital and operating expenses. 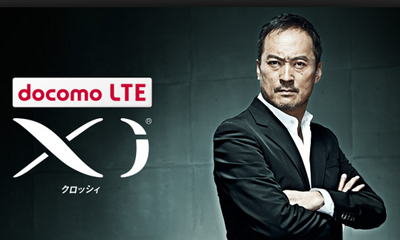 These features are planned to be available to NTT Com customers starting Q2 2014," said Akira Arima, CEO of NTT Com. Virtela Technology Services (Virtela), which is based in Denver, is a leading global managed and cloud network services provider serving over 500 multinational companies. Virtela integrates 1,000+ local and regional network providers, enabling the customer to build a virtual overlay network from multi-carrier MPLS, Ethernet, DSL, 3G/4G/LTE and other IP links, while benefitting from a single SLA and management portal. Virtela operates global operations and delivery centers in the U.S., India and the Philippines. It has over 400 employees. 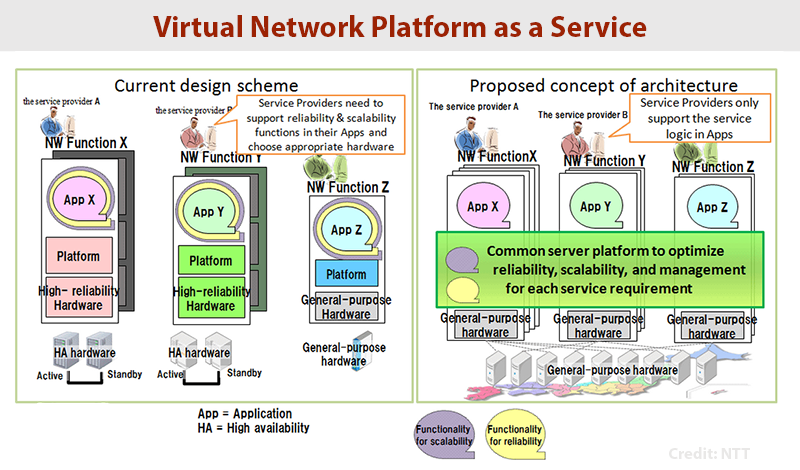 In May, NTT, Alcatel-Lucent Japan Ltd. and Fujitsu demonstrated Virtual Network Platform as a Service (VNPaaS) to ETSI's NFV ISG. The Virtual Network Platform as a Service (VNPaaS) is one of the use cases defined by ETSI NFV ISG. The platform framework can be used for developing, deploying and administering applications on the virtualised network. Alcatel-Lucent supplied its CloudBand NFV solution for this project. Fujitsu is supplying middleware that is capable of offering stateful VNF. Dimension Data, which is the $6 billion global ICT solutions and services division of NTT, announced plans to launch cloud-based Enterprise Mobility-as-a-Service (EMaaS) that will provide enterprise clients with an extensive policy framework and secure access to corporate information from any device, ensuring appropriate authentication and corporate governance adherence. Dimension Data's EMaaS offering will deliver comprehensive policy-based, device-independent, mobile device management, mobile expense management, and integration to the enterprise underpinned by true cloud principles of automation and consumption-based commercials. The service, which utilizes a cloud-based consumption model, enables organizations to rapidly scale deployments while easily managing the complex environment of mobile devices, data access and expense management. Due to the complex nature of mobility deployments, the EMaaS offering is complemented by Dimension Data's Systems Integration and Professional Services competencies and addresses the full spectrum of an organization's enterprise mobility needs. The company said EMaaS establishes the platform for the Group's future initiatives that will see Dimension Data announce increased functionality and feature sets that assist enterprise clients to deal with their rapidly changing end user computing requirements. "The launch of EMaaS is an important step for Dimension Data as it marks the establishment of the platform that we will use to rapidly evolve to deliver enterprises with a suite of services that addresses their emerging user-centric end-user computing requirements. EMaaS was designed to address an immediate requirement of enterprise clients around mobile devices, smart devices and how to ensure these new devices can be incorporated into their business in a rapid, yet controlled and secure way. EMaaS is an integral component of the Group's combined strategy to support a truly user-centric computing model through our Cloud, Enterprise Mobility and End-user Computing groups," stated Ettienne Reinecke, Dimension Data's Group CTO and Group Executive, End-user Computing. 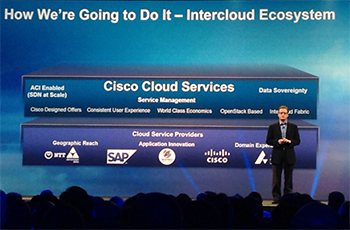 Cisco recently named Dimension Data as one of its key partners to extend its vision of the Intercloud. The partners will align their public cloud infrastructure to the Cisco Cloud architecture and deliver Cisco Cloud services to customers and resellers.Cisco's open Intercloud allows local hosting and local provider options that enable data sovereignty. The hybrid cloud capabilities that differentiate the Cisco Cloud are built upon the Cisco Application Centric Infrastructure (ACI) and Cisco Intercloud Fabric technologies. Microsoft and salesforce.com announced a strategic partnership to create new solutions that connect salesforce.com's customer relationship management (CRM) apps and platform to Microsoft Office and Windows. 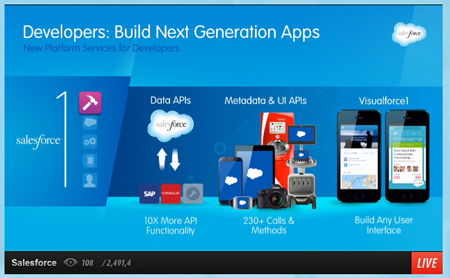 Salesforce for Windows and Windows Phone 8.1. Will enable customers to access Salesforce and run their business from their Windows devices. A preview is planned to be available in fall 2014 with general availability in 2015. "We are excited to partner with salesforce.com and help customers thrive in a mobile and cloud-first world," said Satya Nadella, CEO of Microsoft. "Working together we'll deliver new solutions that connect the customer insights of Salesforce to the cloud productivity of Office 365, the cloud platform of Azure and the mobility of Windows, so our customers can do more." FairPoint Communications, which operates a fiber network spanning more than 16,000 route miles in northern New England, announced the availability of Ethernet-based bandwidth and transport capacity of up to 1 Gbps for its business, government and education customers. The symmetrical Ethernet service will reach more than 35,000 eligible customer locations in 32 markets across Maine, New Hampshire and Vermont. "Being able to connect quickly and confidently between health care providers across the region is mission-critical to enable NETC facilities to provide top quality care through enhanced telemedicine and information sharing," said Jim Rogers, president of ProInfoNet and the founder of New England Telehealth Consortium (NETC). "We offer each location speeds up to 1 Gigabit, fostering the connections needed to meet the industry requirements for fast, reliable bandwidth." 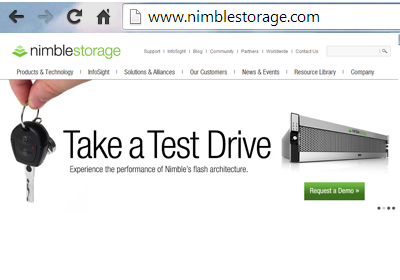 Nimble Storage reported revenue of $46.5 million for its first quarter of fiscal 2015, compared to $22.1 million in the first quarter of fiscal 2014, representing growth of 110% year-over-year. Non-GAAP Gross Margin of 66.2% for the first quarter of fiscal 2015, compared to 61.8% in the first quarter of fiscal 2014. GAAP net loss for the fiscal first quarter was $19.6 million, or $0.28 per basic and diluted share, compared with a net loss of $9.4 million, or $0.47 per basic and diluted share in the fiscal first quarter of 2014. "Our performance during the first quarter of fiscal year 2015 continues to validate our belief that a major transition is underway within the storage industry driven by flash as a disruptive ingredient. Our execution during the quarter underscores our belief that we have built the leading next generation flash storage platform," said Suresh Vasudevan, chief executive officer, Nimble Storage. The company recently announced that more than 200 enterprise customers have implemented its SmartStack converged infrastructure solutions to accelerate deployment and eliminate risks associated with their datacenter infrastructure. Since late 2012, Nimble Storage has rolled out a series of SmartStack solutions, built on Cisco UCS and pre-validated through ecosystem partners including Citrix, Microsoft, Oracle, and VMware. 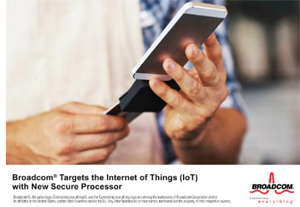 Broadcom has begun sampling a new secure processor designed for a wide range of endpoint applications including payment terminals and devices aggregating data from Internet of Things (IoT) applications. The new addition to the StrataGX family, the BCM58300, incorporates the most advanced hardware security, a high performance ARM Cortex A9 processor running up to 1.25GHz and versatile communications and user interfaces. The ARM Cortex A9 processor also includes L1 and L2 caches, ARM NEON Single Instruction, Multiple Data (SIMD) architecture extensions and floating-point unit to support enhanced graphics, audio, video, and other capabilities. In addition, the device is integrated with enhanced BroadSAFE Security, which provides strong hardware-based protection for critical user and payment data without impacting system performance. BroadSAFE capabilities include hardware cryptographic acceleration, Secure boot, Security Protection Logic such as Tampers, Monitors, Sensors, and battery-backed logic. In addition the BCM58300 family integrates ARM TrustZONE secure processing architecture. Reliance Jio Infocomm, a subsidiary of Reliance Industries Limited (RIL), has selected DragonWave's packet microwave radio systems for its nationwide 4G/LTE network. 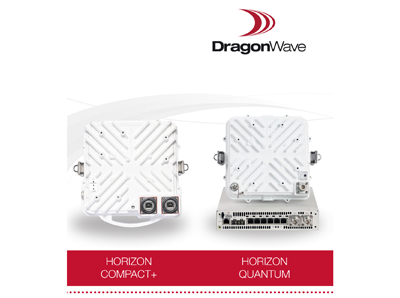 DragonWave will provide several thousand turnkey Horizon Compact+ links to support traffic backhaul from the LTE network. The deployment will also include services to be delivered by DragonWave’s Indian joint venture, DragonWave HFCL. The first orders have been received for 5,000 links and related services. 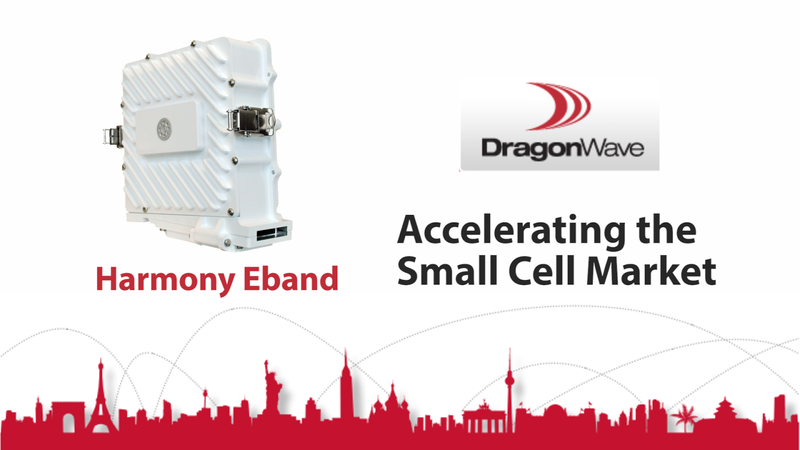 DragonWave’s Horizon Compact+ was extensively tested by Reliance Jio and found acceptable for use as transport system for high capacity backhaul to support their upcoming 4G network. Horizon Compact+ uniquely offers a combination of 2048 QAM modulation together with the industry’s only bandwidth accelerator bulk compression capability, to deliver unsurpassed spectral efficiency. “We are delighted that DragonWave products have been selected by Reliance Jio. This selection demonstrates DragonWave’s product leadership. This is also DragonWave HFCL’s first major services win in India, showing our deployment capabilities have matured,” said Ram Raghavan, DragonWave HFCL CEO. Presented by Peter Allen and Greg Friesen. Telefónica is working with Red Hat and Intel to create a virtual infrastructure management (VIM) platform based on open source software running on standard Intel-based servers. Telefónica said this collaboration will become part of its recently created Network Functions Virtualization (NFV) Reference Lab aimed at helping their ecosystem of partners and network equipment providers (NEPs) test and develop virtual network functions along with upper service orchestration layers. ”For NFV we need to avoid closed and non-interoperable environments, which would hamper its widespread adoption. For that purpose, we have launched the Network Functions Virtualisation Reference Lab, where Telefónica, along with key players from the industry, is working to enhance baseline virtualisation technologies from the open source community and contributing them back to the upstream community, to avoid technological fragmentation,” stated Enrique Algaba, Global CTO and Network Innovation and Virtualisation Director, Telefónica I+D. “Red Hat is currently the leading contributor to the upstream Linux kernel, KVM, and OpenStack projects which create a foundation for NFV workloads. This deep experience in the open source community, along with Red Hat’s focus on performance, reliability and security, offers CSPs a unique value proposition. We’re thrilled to bring our technical expertise, community experience and product offerings including Red Hat Enterprise Linux OpenStack Platform to the collaboration with Telefónica and Intel to help CSPs reap the benefits of NFV first hand,” said Radhesh Balakrishnan, general manager, Virtualization and OpenStack, Red Hat. “By applying our experience of cloud technologies and business models along with our server and virtualization technology leadership to NFV applications, Intel aims to improve total cost of ownership and reduce time-to-market for applications for service providers, Through our work with Telefonica and Red Hat on this new lab, we will enable a broader ecosystem of developers that will accelerate the commercial availability of NFV solutions,” said Rose Schooler, vice president and general manager, Communications and Storage Infrastructure Group, Intel. At Mobile World Congress in Barcelona earlier this year, Telefónica unveiled UNICA -- it's end-to-end vision for virtualized network infrastructure for transforming the company into a "Digital Telco." 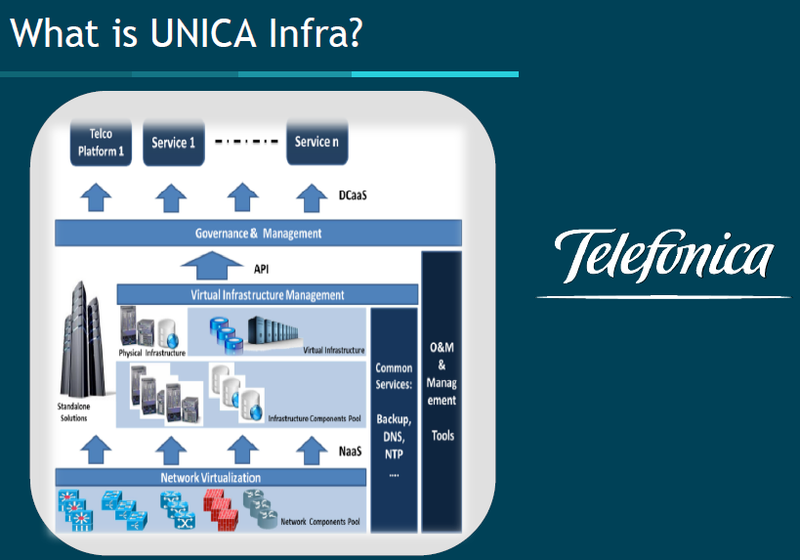 Telefónica described UNICA as a paradigm shift in the way networks are designed, installed, provisioned and managed. Its first goal is to address the logical re-grouping of resources needed to deploy a new services via the new generation data centers it is building. The idea is to use extremely efficient data centers to deploy platforms and telecommunication services faster than ever before. Telefónica will pursue an "Open Telco" model with a global network infrastructure on which multi-vendor platforms, features and services can be developed in standardized form. Telefónica also said that it believes the redesign of its network should be gradual and seamless and foresees an implementation start date of sometime in June 2014. The company expects to have more than 30% of its new infrastructures managed in accordance with this model by 2016. At #MWC14, Telefónica demonstrated a few UNICA use cases, including the idea of multi-tenancy (where the same basic solution works for multiple organisations) or NaaS (Network as a Service), using pre-installed templates to deploy virtualised equipment in real time and with integrated resource management. In partnership with Huawei, Telefónica showed UNICA’s capabilities and performance requirements. In addition, Ericsson and Telefonica launched a joint R&D program focused on NFV and service provider SDN. The companies will define a joint view on how the transformation of networks should take place, sharing a common outlook on the order in which network functions will be virtualized and which applications are likely to give the most benefit. In 2013, Telefónica inaugurated the first phase of its massive Alcalá Data Centre project outside of Madrid, which aims to be one of the largest Tier IV data centers in Europe and the world. The first phase, which is now operational, is a new building measuring 24,700 m2, with seven IT rooms covering an area of 682 m2 each. The complete project, which will progress gradually, will cover a total area of 65,700 m2 (over 700,000 square feet) and include a further 16 IT rooms, on a 78,400 m2 plot of land (the size of 8 football pitches). Telefónica said the new facility is key to transforming the company into one of the leading companies in the new digital world. The data center will be home for the whole range of ICT services, from housing, infrastructures and cloud computing to full outsourcing of customer applications. It will also operate as Telefónica’s cloud services base for Europe and will house platforms for customers in Spain, the United Kingdom, Germany and the Czech Republic. Cyan is collaborating with Telefónica and Red Hat to develop a network functions virtualization (NFV) architecture to support the deterministic placement of virtualized network functions (VNFs). Specifically, Cyan is delivering the NFV orchestrator that will make use of enhancements being made to OpenStack developed by Red Hat in close collaboration with Telefónica. 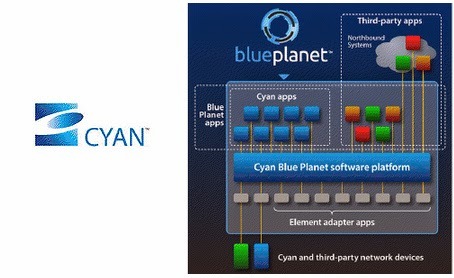 Cyan’s Blue Planet SDN Platform uses Red Hat Enterprise Linux OpenStack to orchestrate the deterministic placement of virtual network functions in the server infrastructure to maximize the performance of that VNF. Huawei introduced its Agile Data Center Cloud Connect Solution that ties together its CloudEngine series of data center switches, the Huawei Agile Controller and cloud applications. 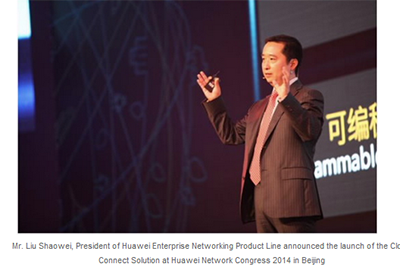 The solution, which was launched at the Huawei Network Congress 2014 (HNC) held in Beijing this week, helps IT administrators to provision network resources. Each type of service can be represented by an independent application profile. The Agile Controller is capable of interpreting three types of perspectives: the application profile perspective, the logical network perspective, and the physical network perspective. The Agile Controller automatically converts application profiles into the required logical networks, and delivers the associated configurations to physical network devices, allowing network resources to be dynamically migrated or adjusted on-demand and based on service requirements. Huawei said it is actively building a cloud computing data center ecosystem. It Cloud Connect Solution connects to VMware’s vCloud cloud management platform and NSX network virtualization platform to provide automated network policy migration and VxLAN based hardware gateway solutions. "In 2012, we launched the Cloud Fabric Data Center Solution and the industry's highest performance data center switches, the CE12800 series, allowing us to build scalable, virtualized, and open cloud data center networks for customers. To date, more than 360 global customers have implemented the Cloud Fabric solution and around 1,800 CE12800 switches have been deployed in cloud computing data centers", said Mr. Liu. "Today, we’ve introduced the Agile Data Center Cloud Connect Solution and we want to work with our partners to build a fully integrated cloud service system. The solution will integrate network, compute, and store resources in data centers to unify the virtual and physical network worlds, implementing multi-cloud connectivity and cloud-based network automation to make cloud computing simpler." 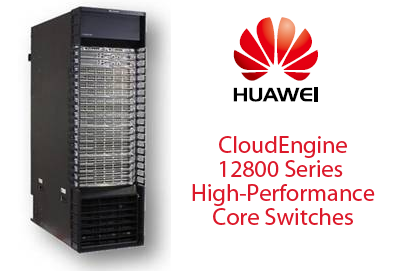 In May 2013, Huawei introduced its CE12816 CloudEngine (CE) switch for the data center core, boasting the a 64 Tbps total capacity. The new switch uses Huawei's next-generation VRP8 software to deliver high-performance L2/L3 switching capabilities. Like all the switches in Huawei's Cloud Engine 12800 family, the CE12816 provides support for 1, 10, 40 and 100 GE connectivity. Densities supported on the CE12816 include up to 192*100GE, 384*40GE, or 1536*10GE line-speed ports. The CloudEngine series provides high bandwidth of up to 2 Tbps per slot(scalable to 4 Tbps) and switching capacity of 64 Tbps. Huawei's CloudEngine series incorporates a Cluster Switch System (CSS) feature to virtualize multiple switches into one logical switch, as well as the Virtual System (VS) feature to virtualize one switch into multiple independent logical devices. Huawei said its CSS and VS capabilities turn the network into a resource pool, allowing network resources to be allocated on demand. The CloudEngine series also supports virtual machines by allowing network administrators to build large-scale Layer 2 networks with over 500 nodes based on TRILL, allowing for fast migration and flexible service deployment. Combined with the usage of the nCenter, network management system, the CloudEngine series is able to achieve over 10 times the virtual parallel processing capability of the industry average. Ericsson signed a long-term lease for a new campus in Santa Clara, California that will consolidate its operations in Silicon Valley. The new Santa Clara Square facility, which is currently under construction by the Irvine Company, will include over 400,000 square feet of workspace for Ericsson in two buildings, located along the Great America/Bowers corridor at Highway 101. Ericsson plans to move approximately 2,000 employees from its IP division in San Jose and its newly-acquired Mediaroom TV business in Mountain View to the new campus. Per Borgklint, Senior Vice President and Head of Business Unit Support Solutions for Ericsson said: "Ericsson's new campus unites our rapidly expanding Silicon Valley workforce and creates an environment that will inspire our employees and customers. So much of our research and development is built on internal and external collaboration. Together with our customers and partners, Ericsson is driving IP, TV and Media innovation, and accelerating development of the media enabled, interoperable and programmable network of tomorrow." "Over the years, Ericsson's growing presence in Silicon Valley has significantly enhanced our ability to innovate and collaborate with our customers and partners in the region. With our new campus, we're accelerating Ericsson research, development and innovation even further," said Maya Strelar-Migotti, Vice President of Development Unit IP and Broadband and Head of Ericsson Silicon Valley. Silicon Valley is also a center for Ericsson innovation in TV and Media. As a leader in the convergence of IP, TV and Media, Ericsson is uniquely positioned to develop the technologies that will transform the television and video entertainment experiences seen by millions of people every day. 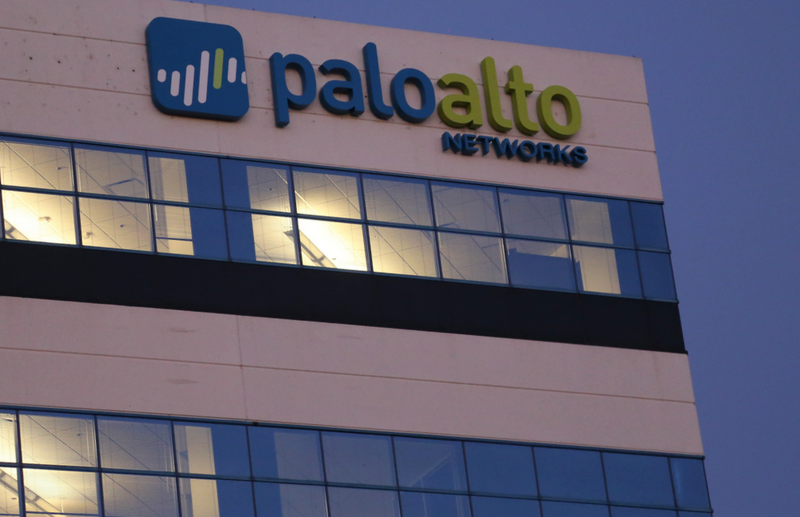 Palo Alto Networks reported record quarterly revenue of $150.7 million for its Q3 ended 30-April-2014, up 49% compared with $101.3 million for the same period in 2013. GAAP net loss for the fiscal third quarter was $139.1 million, or $1.86 per diluted share, compared with a net loss of $7.3 million, or $0.10 per diluted share, in the fiscal third quarter of 2013. "We reported record revenue in our third quarter driven by strong customer demand for our next-generation enterprise security platform. We achieved the highest rate of new customer acquisition in our history and now serve more than 17,000 customers globally to address their security needs and prevent increasingly sophisticated and complex cyber attacks from compromising an organization's critical assets," said Mark McLaughlin, president and chief executive officer of Palo Alto Networks. "We also announced this afternoon that we have reached a settlement with Juniper Networks of all litigation matters between us; this allows us to further focus our resources and time on our customers and growing our business." "Year-over-year revenue growth of 49 percent was driven by our land, expand and retain model, as product, recurring subscription and support revenue all delivered substantial growth," said Steffan Tomlinson, chief financial officer of Palo Alto Networks. "Additionally, we continue to demonstrate the power of our hybrid SaaS model as gross margin and operating margin improved sequentially, and we generated $28.4 million of free cash flow in the quarter, bringing our fiscal year to date total to $83.2 million." Palo Alto Networks has agreed to pay $175 million to Juniper Networks to settle patent litigation between the firms. Under the terms of the settlement, Palo Alto Networks will make a one-time payment to Juniper Networks of $75 million in cash and $100 million in shares of common stock and warrants to purchase common stock. The companies have agreed to dismiss all patent litigation pending in Delaware and California. "Juniper Networks initiated this litigation in order to protect our intellectual property and investment in innovation that is reflected in our leading security products," said Mitchell Gaynor, executive vice president and general counsel, Juniper Networks. "This settlement fully achieves those objectives, and we are very pleased with this resolution." Palo Alto Networks was founded by Nir Zuk (CTO), Rajiv Batra (VP of Engineering) and Yuming Mao (Chief Architect). Zuk was previously CTO at NetScreen Technologies, which was acquired by Juniper Networks in 2004. Prior to NetScreen, Nir was co-founder and CTO at OneSecure, a pioneer in intrusion prevention and detection appliances. Nir was also a principal engineer at Check Point Software Technologies and was one of the developers of stateful inspection technology. Batra previously was the Vice President of Engineering at Peribit, which was acquired by Juniper Networks in 2005. He also co-founded VitalSigns Software and served as Vice President of Engineering at Bay Networks. Mao previously was Chief Architect and a Distinguished Engineer at Juniper Networks, which he joined through the NetScreen Technologies acquisition. At NetScreen, he was one of the initial engineering architects. F6 Networks is deploying Ciena’s converged packet optical and packet networking solutions to deliver 100G connectivity between Saint John and Fredericton, New Brunswick. F6 Networks is building an open access, dark fibre network that provides broadband connectivity between Atlantic Canada and the Northeastern United States for public sector organizations, private enterprises, Internet services providers and wireless carriers. The deployment features Ciena’s E-Suite family, including Ciena's 6500 Packet-Optical Platform, Ciena’s Metro Ethernet Forum (MEF) CE2.0-certified 5142 Service Aggregation Switches, and Ciena’s CE2.0-certified 3916 and 3930 Service Delivery Switches. Ciena’s Service-Aware Operating System (SAOS) will provide zero-touch provisioning, line-rate service activation testing, and remote troubleshooting – all of which help to reduce operating costs for F6 while improving user experience. “To thrive in the global economy, Atlantic Canada must maintain a telecommunications infrastructure that is both world-class and cost-effective. F6 is part of a growing tech community striving to drive economic development, job creation and quality of life in the region and Ciena’s platforms position us to meet this goal," stated Eric Morin, chief technology officer, F6 Networks. 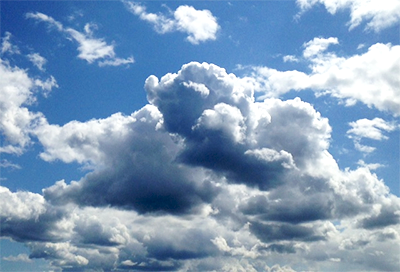 HP Enterprise Services is building a secure private cloud solution designed for governments and public sector agencies. HP said its new Helion Managed Private Cloud for Public Sector will offer a managed, dedicated private cloud that enables federal, state and local governments to implement a shared service model across multiple departments. The managed private cloud allows agencies to act as IT brokers by accessing a web-based portal to manage consumption and monitor resources, allowing charge back of costs to departments and business units. It is designed to address the unique certification and regulatory compliance needs of the federal government, including the Federal Risk and Authorization Management Program (FedRAMPSM) moderate impact level, FISMA high, HIPAA and the Defense Information System Agency Enterprise Cloud Service Broker (DISA ECSB) impact Level-5. MATRIXX Software, a start-up based in Mountain View, California developing a unified policy and charging solution for network operators, has received financial backing from Telstra Ventures. Financial terms were not announced. Telstra Ventures was joined by existing investors Swisscom Ventures, Innovacom, Greylock Partners, Adams Street Partners and Tugboat Ventures in the round. 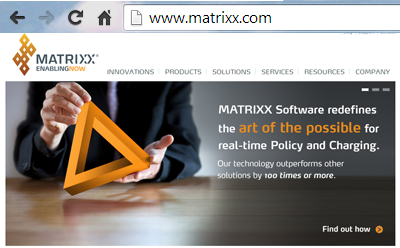 MATRIXX has developed new real-time technology designed for the intensive demands of the digital services environment. The company says its real-time charging, policy and analytics solutions can drive the transformation of a service provider’s business from traditional communications to digital services. MATRIXX is headed by Dave Labuda, who previously co-founded Portal Software in 1994, creating the first real-time billing and revenue management solution for internet and communications service providers. Portal Software was acquired by Oracle in 2006. NTT DOCOMO confirmed that it is working separately with three vendors — Alcatel-Lucent, Cisco and NEC — and has completed proof-of-concept (PoC) trials verifying the feasibility of network functions virtualization (NFV). DOCOMO said it now aims to commercially deploy services utilizing a virtualized mobile network by the fiscal year ending in March 2016. The PoC testing covered virtualized Evolved Packet Core (EPC) implementations. DOCOMO and each of the three vendors verified cutting-edge network control mechanisms, such as scalable user-data processing capability that can handle concentrated user traffic efficiently and improve service delivery stability by means of fast, automatic network-recovery techniques in the event of hardware failure. Dimension Data, the $6 billion global ICT solutions and services provider, introduced a Software-defined Networking (SDN) Development Model aimed at helping its enterprise customers update their infrastructured. Dimension Data's SDN Development Model features a consulting-led, facilitated workshop that will provide clients with a series of recommendations on how to implement an SDN program, and what specific actions to take to ensure its success. "Software-defined networking is not just a trend, but an important shift that will drive significant changes in how networks are built and operated – and ultimately, the entire networking industry," said Rob Lopez, Dimension Data's Group Executive – Networking. 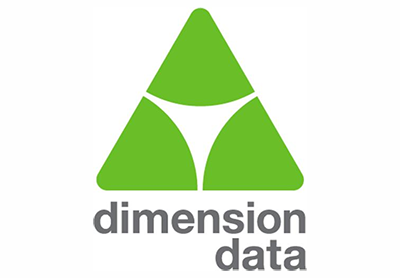 "As an organization with a 31-year history of designing, architecting, deploying, maintaining and supporting network solutions and infrastructure, Dimension Data is uniquely positioned to educate our global clients about SDN. With the insights delivered through our Software-defined Networking Development Model, organizations will be in a strong position to move ahead with their SDN journey in a structured and coherent manner." Small Cells offer the opportunity to radically improve the capacity of wireless networks in enterprises and urban networks. 1:07 - How will VoLTE impact the Small Cell market? 1:55 - Is it possible to support both TDD and FDD in the same Small Cell platform? 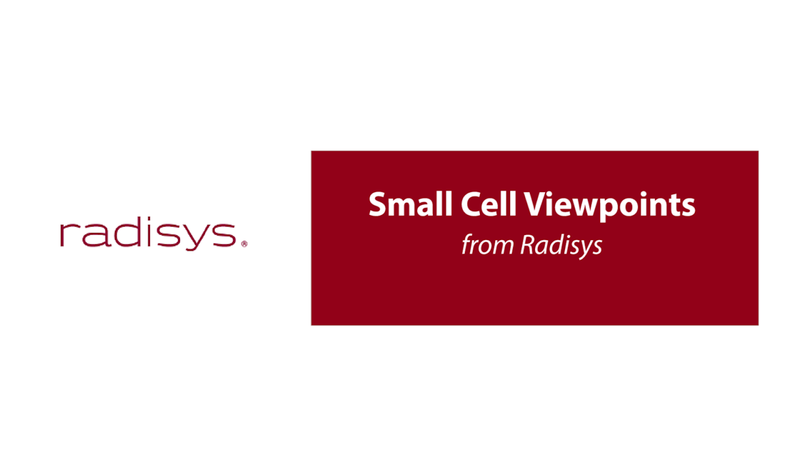 2:41 - What is the essential value proposition that Radisys delivers to its Small Cell customers? 3:44 - Do mobile operators sometimes have their own requirements for Small Cell equipment? 4:56 - Key technology partners for Small Cells? 5:40 - What can we learn from the massive Small Cell rollouts in Korea? The EUTELSAT 3B satellite was successfully launched from Sea Launch's ocean-based Odyssey platform using a Zenit-3SL rocket. The EUTELSAT 3B satellite, which weighs 5,967 kilograms, operate three commercial payloads in the C, Ku and Ka bands. The satellite will enable Eutelsat to diversify its commercial response to Internet Service Providers, telcos, government agencies and broadcasters operating in Latin America, Europe, Africa, the Middle East and Central Asia. EUTELSAT 3B has a designed in-orbit lifetime exceeding 15 years. 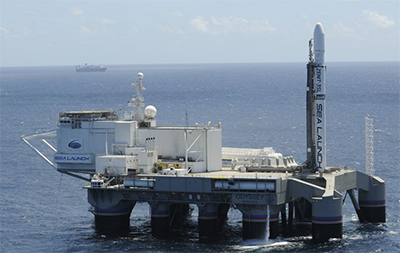 This marks Sea Launch's first mission in 2014, its third for Eutelsat, one of the world’s leading satellite operators, and its 36th mission overall. Oklahoma-based Bolt Fiber Optic Services has selected Alcatel-Lucent to supply an end-to-end triple-play solution for delivering up to 1 Gbps broadband connectivity as well as voice over third-party VoIP service and television services to communities in rural northeastern Oklahoma. The 1 gigabit service is expected to launch later this year. The network will use Alcatel-Lucent's 7360 Intelligent Services Access Manager, 5520 Access Management System, Triple Play Express and Video Systems Integration solutions. Alcatel-Lucent is also the systems integrator for the project, providing end-to-end architecture, design, engineering and installation services and 3rd party solutions for the headend, OSS/BSS, fiber mapping, and Mediaroom middleware and software for IPTV services. Bolt is a subsidiary of Northeast Oklahoma Electric Cooperative, which serves 30,000 customers. 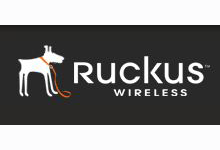 Boingo Wireless is deploying thousands of Ruckus Wireless' indoor and outdoor Smart Wi-Fi access points across dozens of United States Army, Air Force and Marine Corps bases. Deployment is underway already at Marine Corps, Army and Air Force bases across the United States, with Boingo Broadband and IPTV service going live as each base installation is completed. "With myriad obstacles and thick concrete walls within a constantly changing environment, both indoors and out, military bases can be a challenging setting for delivering reliable high-speed wireless access," said Marc Patterson, vice president, product management for Boingo Wireless. "We found Ruckus Smart Wi-Fi technology to be ideally suited for tackling these challenges by providing extended Wi-Fi coverage and signals that adapt within these changing environments." 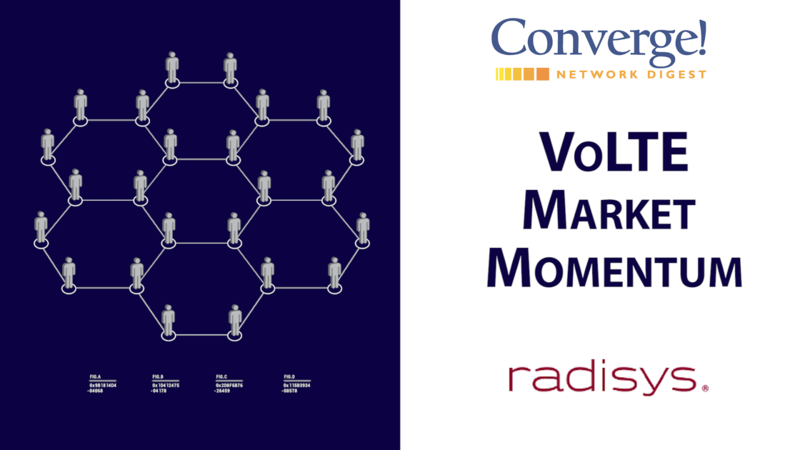 Thanks to virtualization, traffic patterns are shifting rapidly and load balancing is becoming a key requirement in next generation systems, says Karl Wale, Director of Product Marketing at Radisys. Load balancing is important because as SDN and NFV architectures are rolled out, access to virtualized pools of resources becomes critical. Dynamic traffic patterns and service chaining will require rapid access to resources wherever they reside. 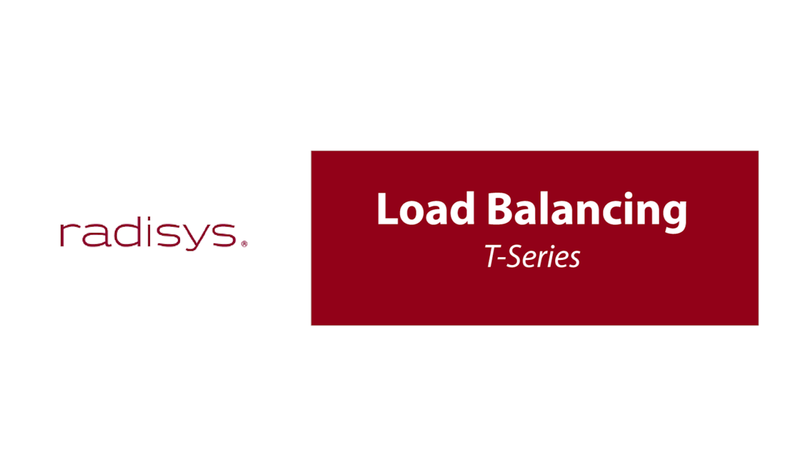 Here Karl introduces the Load Balancing capabilities of the Radisys T-Series platform. Google Compute Engine is now offering of CoreOS, a a new open source operating system that enables users to run their cloud applications, including applications that require Docker container support. Google says the clustering features in CoreOS pair perfectly with VMs that boot quickly and have a super-fast network connecting them. CoreOS integrates with Google load balancers and replica pools. This allows applications to be scaled across regions and zones. CoreOS takes a minimalist coding approach, claiming to require 50% less RAM on boot than an average Linux installation. It is designed to be clustered. Researchers at Nippon Telegraph and Telephone (NTT) have developed an optical random access memory (RAM) device that integrates ultrasmall optical memories based on photonic crystal nanocavities. 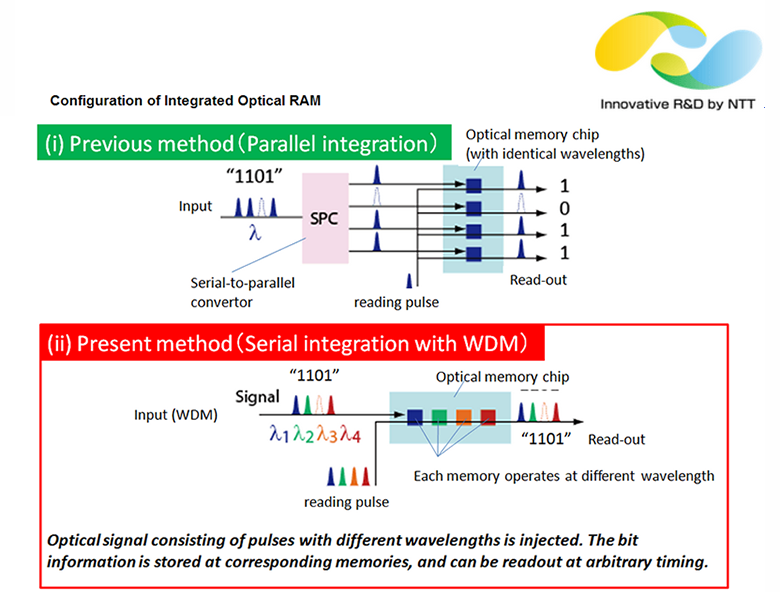 Specifically, NTT Nanophotonics Center has succeeded in large-scale integration of over-100-bit optical memories with a wavelength division multiplexing (WDM) configuration. This was enabled by novel optical nanocavities based on a photonic crystal. The scale of this integration demonstrates the feasibility of optical random access memories for optical processing. Results of this research will be published this week in the UK science journal “Nature Photonics”. Telenor Group signed a global frame agreement making Alcatel-Lucent a candidate provider for 4G LTE networks to the subsidiaries in 13 countries in Europe and Asia. The agreement offers Telenor subsidiaries Alcatel-Lucent’s leading 4G LTE Overlay solution as an alternative to single RAN deployment. Included in the scope of the agreement are Alcatel-Lucent’s 4G LTE Radio Access Network and the 5620 Service Aware Manager. Telenor has selected Nokia as a candidate supplier for radio access equipment and professional services over a period of five years. The deal covers upgrades to Telenor networks across Europe and Asia. Financial terms were not disclosed. Bouygues Telecom has selected Ericsson to provide key components of the IMS solution for VoLTE including the Ericsson Multimedia Telephony Application Server Ericsson Session Border Gateway, Ericsson Home Subscriber Server and Ericsson User Profile Gateway, as well as software upgrades to the installed base of Ericsson LTE radio access network and Ericsson Evolved Packet Core. Bouygues Telecom is preparing to introduce VoLTE services to its live, commercial 4G/LTE network in France. The service will bring major benefits, including HD voice, shorter call set-up times and enriched IP-based communication services such as video calling over LTE. Customers will have the flexibility to make HD voice calls and use 4G/LTE mobile data services at the same time. Jean-Paul Arzel, Head of the Networks Division, Bouygues Telecom, says: "Bouygues Telecom is proving the capabilities of its 4G/LTE network to support the latest advanced technologies and services. Commercial service roll-out is scheduled for 2015 and our network will be carrying the first voice and video calls over LTE later this year." Franck Bouétard, Head of Ericsson France, says: "Ericsson has been a partner of Bouygues Telecom for many years, in particular for 4G/LTE technology. With the combination of our leadership in both technology and services we are now supporting Bouygues Telecom in its latest move to improve network and service quality for French customers." 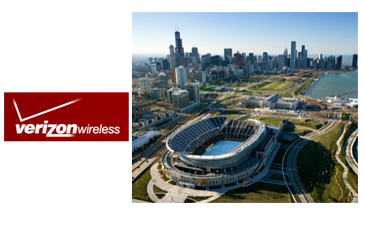 Verizon Wireless tested LTE Multicast services over a commercial 4G LTE network using Ericsson’s LTE Broadcast solution at the Indy Motor Speedway in the weeks leading up to the Indy 500. During the race, Verizon LTE Multicast capabilities were demonstrated via a series of cameras deployed both trackside and in-car providing IndyCar teams with real time race visibility. "Verizon has taken the lead by being first in the US to deliver video multicast services over its commercial LTE network in such a challenging environment. Ericsson’s LTE Broadcast solution is designed to deliver the high performance and great video experience that Verizon’s LTE Multicast Service demands at events like the Indy 500," stated Johan Wibergh, Head of Business Unit Networks at Ericsson. Level 3 Communications has appointed James O. Ellis, Jr., as Chairman of the Board at its Board of Directors, replacing Walter Scott, Jr.
Ellis has been a member of the Board since March 2005. Since November 2013, he has served as an Annenberg Distinguished Visiting Fellow of the Hoover Institution at Stanford University. From May 2005 until May 2012, Ellis was the president and CEO of the Institute of Nuclear Power Operations. He is a member of the Board of Directors of Lockheed Martin and Dominion Resources, and served on the Board of directors of Inmarsat PLC until March 2014. Ellis is former commander of the United States Strategic Command at Offutt Air Force Base in Nebraska, where he had global responsibility for strategic warning systems, integrated missile defense, space operations and other critical national defense functions. With commercial VoLTE launches underway or soon to be launched by the likes of AT&T, NTT DOCOMO, T-Mobile and Verizon, it's clear that advanced voice/video capabilities are going mainstream on LTE networks. 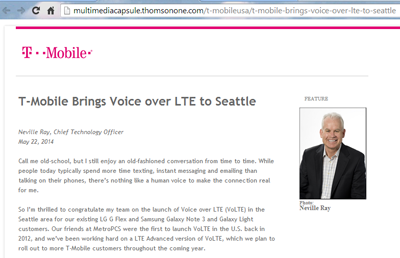 T-Mobile activated Voice over LTE (VoLTE) in the Seattle area for customers using LG G Flex and Samsung Galaxy Note 3 and Galaxy Light devices. In a blog post, Neville Ray, Chief Technology Officer at T-Mobile, said the rollout uses Enhanced Single Radio Voice Call Continuity (eSRVCC), a new LTE Advanced function. T-Mobile is the first to deploy it in the U.S.
T-Mobile is working on rolling out VoLTE in other markets nationwide. It also plans to launch a host of rich communication services and additional innovations around Wi-Fi calling over the coming months. He also noted that MetroPCS was the first to launch VoLTE in the U.S. back in 2012. 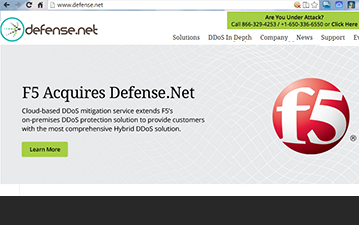 F5 Networks (has acquired Defense.Net, Inc., a privately-held provider of cloud-based security services for protecting data centers and Internet applications from distributed denial-of-service (DDoS) attacks. Financial terms were not disclosed. Defense.Net was founded by Barrett Lyon, one of the pioneers of DDoS mitigation. The company operates a massive, cloud-based service designed to absorb even the largest DDoS attacks. The Defense.Net network supports multiple protocols and provides features for remediation and control to safeguard customers from unforeseen threat vectors, while maintaining application performance. F5 said Defense.Net’s high-capacity cloud service is complementary to its own on-premise DDoS Protection capabilities. The advanced technologies and operational experience shared between the two companies will expand F5’s portfolio of security solutions for defense against Internet-based DDoS attacks on networks, data centers, and applications. Defense.Net is based in Belmont, California. It has data centers in San Jose, California and Ashburn, Virginia. AMD has achieved record scalability of 168,000 virtual machines on 576 physical hosts, all provisioned on its SeaMicro SM15000 server. 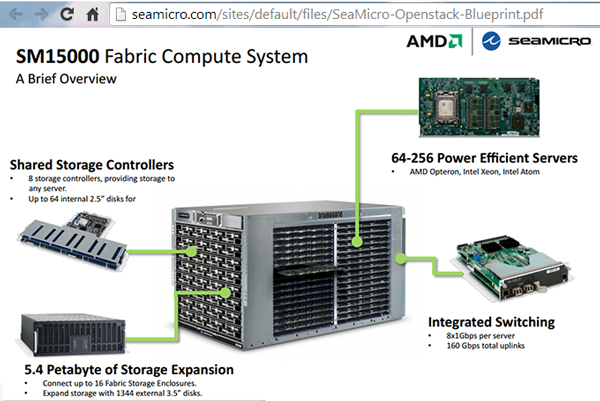 AMD said the first 75,000 virtual machines were deployed in six hours and thirty minutes. The record demonstration was achieved in collaboration with Canonical using the Ubuntu OpenStack (Icehouse) distribution. MaaS (Metal as a Service), part of Ubuntu 14.04 LTS and Ubuntu OpenStack, was used to deliver the bare metal servers, storage and networking. AMD’s SeaMicro SM15000 is a high-density, 10 rack unit system that links 512 compute cores, 160 gigabits of I/O networking and more than five petabytes of storage with a 1.28 terabyte high-performance supercompute fabric. The SM15000 server design eliminates top-of-rack switches, terminal servers and hundreds of cables. It currently supports the next-generation AMD Opteron (Piledriver core) processor, Intel Xeon E3-1260L (Sandy Bridge), E3-1265Lv2 (Ivy Bridge), E3-1265Lv3 (Haswell) and Intel Atom N570 processors. Telstra has demonstrated downlink speeds of 450 Mbps using LTE Advanced Carrier Aggregation across a trial combination of 1800MHz and 2600MHz bands over its live network. Telstra worked with Ericsson to install equipment for two new 4G Frequency Division Duplexing (FDD) channels of 20MHz bandwidth each on the 2600MHz spectrum band (40MHz FDD), aggregated with live 20MHz of 4G on the 1800MHz band. The result was three simultaneous side-by-side paths for the data to travel through to the operational core network. Telstra also used an advanced prototype Cat 9 engineering device that could combine the three channels to achieve these speeds. "Conducting this type of test is a significant step in the network engineering and development process. It is essential for us to see how this type of technology works in the live network and understand what needs to be done to continue to absorb the exploding demand in mobile broadband and offer an exceptional customer experience,” Mike Wright, Group Managing Director Telstra Networks. ”Telstra has the largest holding of APT700MHz and 2600MHz spectrum in Australia and we expect we will eventually be able to offer this service across much if not most of our mobile network footprint, allowing more of our customers to benefit from improved capacity and faster speeds,” said Mr Wright. In February 2014, Ericsson and Qualcomm Technologies conducted the first inter-vendor interoperability testing of LTE Category 6, which promises potential speeds of up to 300 Mbps. The final stages of testing, which were completed in collaboration with Telstra, was based on ready-to-release versions of Ericsson's L14A software release. 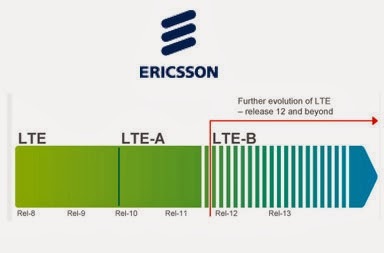 Ericsson said its L14A software leverages load balancing for better spectrum efficiency and improved user experience during high-load situations. It supports all bandwidth and frequency combinations for up to 40MHz Carrier Aggregation, providing users with speeds of up to 300 Mbps. The test also used Qualcomm;s fourth-generation 3G/LTE multimode modem, the Qualcomm Gobi 9x35 chipset. 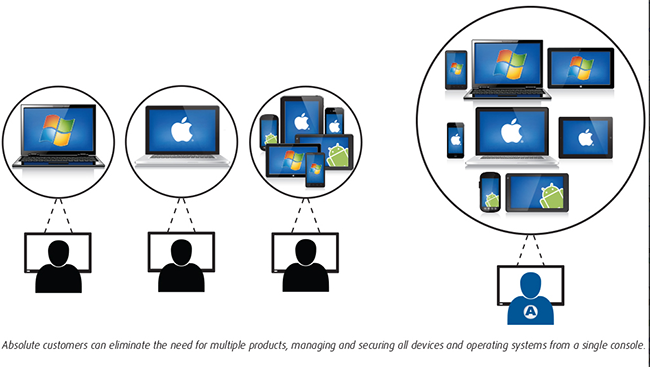 Absolute Software, which offers a persistent endpoint security and management module that can be embedded in the firmware of computers, laptops, tablets and smartphones, announced full BYOD support for Mac and Windows computers. Absolute persistence technology is built into the BIOS or firmware of a device during the manufacturing process. Once activated, customers who purchase these devices benefit from an extra level of security. The company said its latest Absolute Manage 6.5 will provide enrollment workflows as well as remote and automated security protocols for corporate and employee-owned devices, including smartphones, tablets and laptops. In addition, integration with Cisco’s Identity Service Engine (ISE) provides an increased level of network security. If a computer or mobile device attempts to access the network, its compliance status is automatically checked against company policy. This ensures all devices on the network are configured appropriately, including Absolute Manage enrollment. If a device is not already enrolled, ISE can redirect it to complete enrollment before allowing access. ADVA Optical Networking, in collaboration with HEAnet, i2CAT and Eurotek, showcased SDN-controlled distribution of 4K video content at this week's TNC2014 conference in Dublin, Ireland. 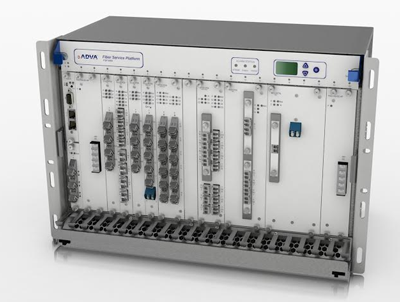 The demo features a software-defined networking (SDN) controller and ADVA's FSP 3000 colorless and directionless reconfigurable optical add drop multiplexers (ROADMs) transporting terabits of data to a multi-tenant cloud-based infrastructure. Telstra announced a strategy to offer all Australians, irrespective of whether they are a Telstra customer or not, access to two million Wi-Fi hotspots across the nation within five years. Telstra is working with Fon, which provides users access to its global syndicate of over 12 million Wi-Fi hotspots. Telstra aims to have its Wi-Fi sharing network launch in early 2015. Australians already have access to one of the world’s leading mobile networks offering fast, unparalleled coverage on the move. Telstra’s new Wi-Fi network will broaden the choice of connection giving people a convenient way to get online using their portable devices when spending time at a hotspot. 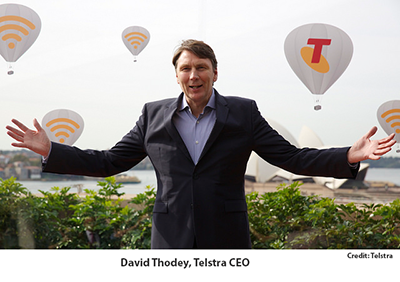 It will offer our customers the unique option to seamlessly use their home broadband allowance inside and outside the home,” stated David Thodey, Telstra CEO. In this video, Daniel Lynch, Senior Product Marketing Manager at Intel, demonstrates a new way of rolling out a small cell site gateways. 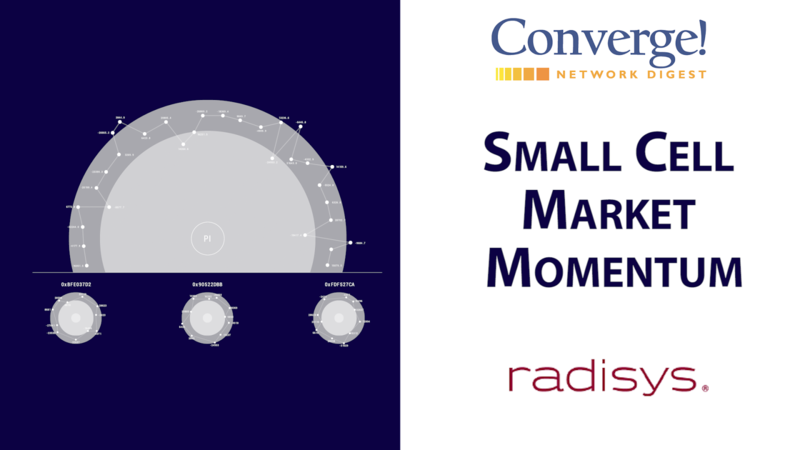 Rather than a closed box in a fixed form factor, this demonstration shows a new, virtualized design based on Radisys technology. 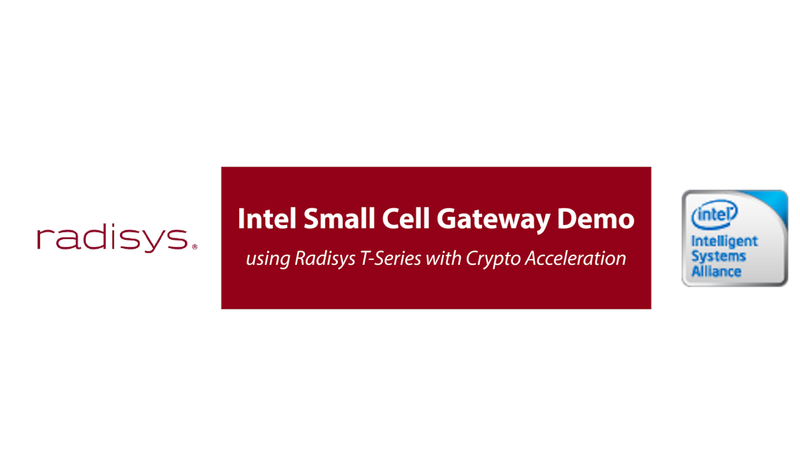 Chandresh Ruparel, Director of x86 Platform at Radisys, explains how a small cell gateway integrated with a virtual EPC and IoT management can be scaled on the new Radisys T-series platforms. Intel introduced a Service Assurance Administrator software solution to help the data center administrators improve the security and management of applications, including OpenStack deployments. 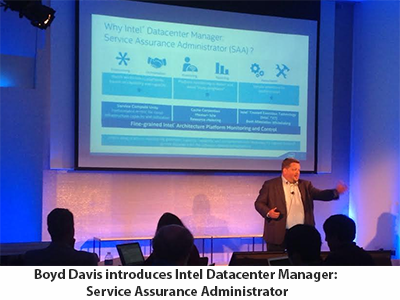 The Intel Datacenter Manager: Service Assurance Administrator (DCM: SAA) improves data center efficiency by ensuring workloads are running on a trusted infrastructure and meet performance expectations in multitenant environments. The idea is to leverage deep platform telemetry built in Xeon processors to gain service-level assurance. Specifically, Intel said deep platform telemetry hardware in the processor and chipset allows its new software to offer reliable and efficient resource management across legacy devices in multitenant environments. The Intel DCM: SAA telemetry capabilities also provide cloud service administrators with deeper insight into performance metrics between the infrastructure and application. Controller: Optimizes the allocation of data center resources by collecting deep platform telemetry data from compute node agents and using that information to place application on the best server for optimal performance and assigned trust. Assured performance: As applications are provisioned in the OpenStack environment, a performance SLA is assigned to the application using an Intel DCM: SAA feature known as a Service Compute Unit (SCU). This SCU specifies the target performance for the application. Intel DCM: SAA then uses the hardware instrumentation to measure the delivered performance and adjust as needed. Trust: Intel Trusted Execution Technology (Intel TXT) obtains a measurement of a server at the time it boots up. The measurement is then used to determine the types of applications that can run on that server, allowing applications to effectively specify the infrastructure trust requirements.